1. The fight scene where Indy is faced with the Arab opponent swinging this huge sword so he pulls out his gun and shoots him. 2. The fight with Pat Roach around the flying wing ending with a shredded Nazi. 3. The creepy Gestapo agent extracting a presumed torture device and assembling it into a coat hanger. Can we have an exact date for this? I want to show my girlfriend the trilogy before the new one comes out, and an assignment date would be really helpful! Your girlfriend hasn't see the Trilogy - you get to watch again, as if for the first time! Awesome. How about Friday May 9th as a deadline? 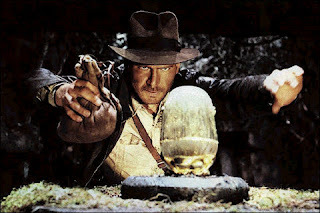 as only a casual fan of the trilogy, i think without a doubt the gun vs. sword scene stands above and beyond as the perfect summation of Indy's true allure. I always admire people who get to live vicariously through the experience of an Indy-newbie. I had shown Raiders to a few virgins once and to my horror they said it was "ok, cuz the effects were kinda lame". AHHH!!!! I seriously started crying right there and then. Anyway, great idea and look forward to the list. Sorry Alan, I ran out of time (college finals and papers and such) but I'm sure the final list will be an excellent one.